The tourism office of Hawaii has ramped up its marketing efforts this winter with a smart traditional and digital marketing campaign. The campaign is geo-targeted to specific areas across the United States. For those areas which have experienced a harsh winter, the marketing plan couldn’t have come at a better time. With just a few more weeks until Spring Break, it offers plenty of time to book that next vacation to Hawaii. I first noticed this marketing plan when I was on my way to work. Throughout one of the main underground stops in Chicago (the State and Lake stop in the Loop), photographs of Hawaii were wrapped around the walls and floor. I’m not talking about a few photos here and there either. I’m talking photographs across entire walls, lining the floor of areas where pedestrians actually walk, and even on the turntables when people walk into and out of the station. It was very impressive and quite the change from our snowy view up on the street. A few days later, I noticed ads on the side of several busses for Hawaii, with similar images to those at the train station. 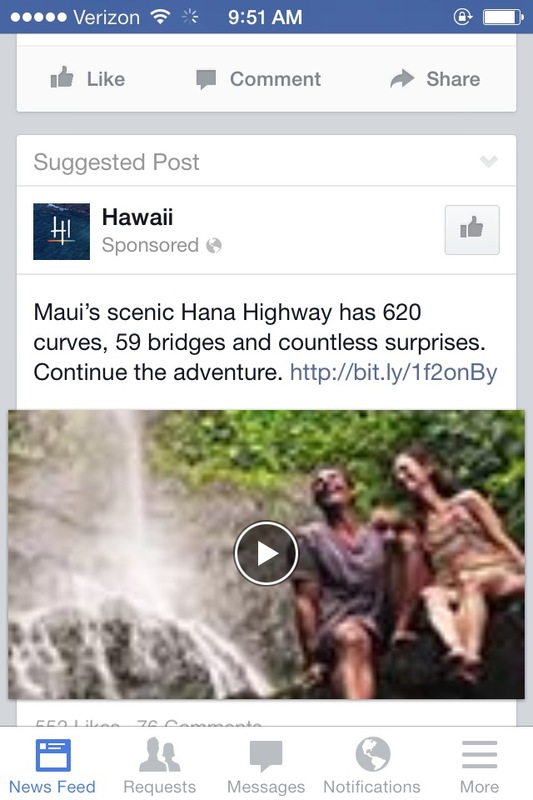 The day after spotting the Hawaii ads at the train station, I was served ads for Hawaii on Facebook. These ads displayed rich videos and photographs of Hawaii beaches, waterfalls, and jungles. They ask users to “continue the adventure” of experiencing Hawaii. Knowing they were advertising at the train station, and seeing these ads on Facebook, I began to learn more about Hawaii and what a vacation there would be like. Why do I think this campaign is so effective? It’s the fact it’s smartly using traditional and digital elements in tandem with one another. As pedestrians commute to and from work, they’re reminded of what an escape to Hawaii would be like. This message is relayed again when people log online and are served similar messaging. Given the Chiberia weather this year, I wouldn’t be surprised if this has generated more than a few booked trips to Hawaii already.